Bonsoir et Bienvenue in the Casino. Yes, this, like most cruise ships, is not just a floating hotel, but also a floating casino. I am French, from the mysterious town of Rennes-le-Chateau, close to Carcassonne and my name is Alais. This is my second contract onboard, I have worked for several years in different Casinos around the world. I am trained in all common games offered in a Casino, such as Blackjack, Roulette, Poker, craps and baccarat. Of course, in relation to some of the Casinos on land it is a small casino but we have a good number of slot machines and various card game machines. We have10 dealers, a pit boss, the Cashier, Slot Technician and Casino Manager here onboard. While casinos on land are open 24 hours and one has to work shifts, it is a little easier for us to work onboard a cruise ship. Due to international regulations, the Casino has to be closed, while the ship is in port. The main reason for this is, that many countries have casinos in their ports and of course, the visited countries want the people to spend money on land and not everything onboard. Therefore we are basically are off duty every time the ship is in port. However we cannot go ashore every time, but certainly we have more possibilities than many of our colleagues, to see the places where the ship stops. 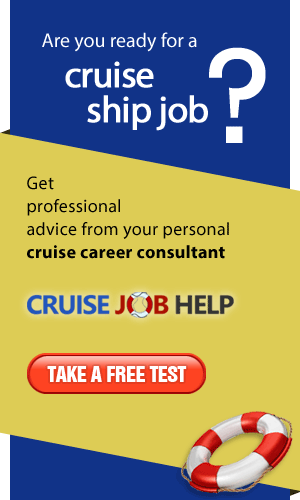 In order to get a position onboard, you have to be a certified Casino dealer with many years experience and have a clean record. 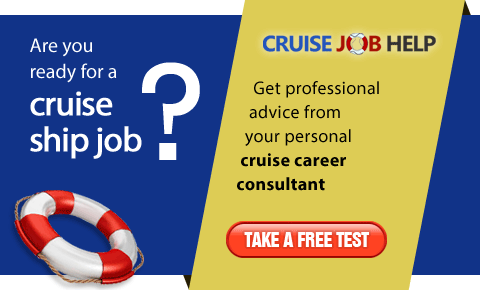 Working for a Casino company which has the concession onboard cruise ships helps greatly. 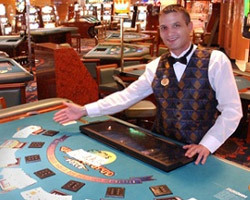 Only a few Cruise lines run their own Casino department. Most others use companies which run Casinos on land. This way, they get the latest games and machines onboard a ship, so guests do not have to do without some of their favourites. On sea-days the Casino is open more or less all day, from 10:00 am until closing time, which, depending on the clientele can be at 3:00 am in the morning if they so wish. These are long days for us, but the casino is well frequented and so we are busy and helps the time to pass quickly. On port days, the ship is very often alongside from morning until evening, so our work starts only once we are out of the 3 mile zone. This is normally the case half an hour after departure from the pier. I have to report for duty at sailing time, in order to prepare my work place. We rotate on the tables, from one game to another. This and going on breaks keeps the concentration up and at times can break a "bad luck streak". Yes, we have that as well, like the players. But it is our task to make the house win the most amount of money possible. Therefore, when I feel like I am running out of luck, I call the Pit Boss, to send another Dealer to replace me and to oversee the handover of the table, which is also called a pit. Unfortunately I have to run, we are opening the casino in an hour and I need to get my assignment from the Casino Manager and get ready for my game. Wish me luck!